New update of ZETLAB Software (release) dt. August 31-st 2018 is now available. The software update mainly encompasses ZETLAB VIBRO Software package, supplied together with shaker controllers (also referred to as Vibration control systems or VCS). Now upon activation of the VCS menu instead of the standard ZETLAB control panel, there appears a new VCS panel. 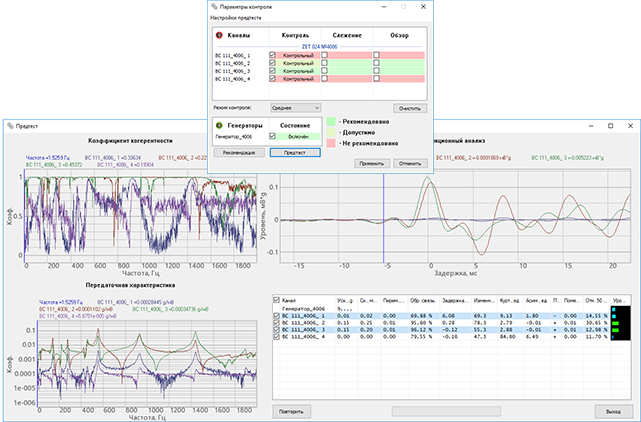 Now the updated interface of the program “Shaker parameters” displays characteristics of the shaker system. For convenience of the users, the program now includes data base of the most popular shaker systems, thus, it is possible to select a particular model of the shaker system or to add a new one together with its characteristics. Updated version of the VCS panel now allows to add characteristics of the tested object of rigging of the shaker system in the corresponding section “Parameters of the product”. The program now allows to enter full name of the specialist who conducts the test and the date of tests performance. This information will be used in the test protocol, which is formed automatically. The software update also includes changes in the “Control parameters” program. Now this program has updated functional range and new interface. In order to increase convenience of the VCS operation, we have added a new function – pre-test. This function allows to select the transducers, that are most suitable for tests performance. These transducers are selected based on analysis of measuring channels response to the test signal. In the course of analysis, the program calculates coherence ratio, conducts correlational analysis and estimates the transfer characteristic. Based on the results of the pre-test, the program produces recommendations regarding the use of each transducer for a particular testing procedure. This function allows the user to produce test profile for a particular product in a short time and with minimal possible errors! The program Broadband random vibration now allows to conduct not only random vibration impact testing, but also combined vibration tests: Sine-on-Random, Random-on-Random, Sine-on-Random-on-Random. For user convenience, the general interface of the program has also been changed. Now the user has access to information about statistics of the parameters used in the course of test procedure, and the load degree values for each of the parameters. Now it is easy to configure parameters of the standalone operation mode for all ZETLAB instruments with the use of properties menu of the Device manager program. For the convenience of the users, we have conducted an update of the main program window interface. Now it is also possible to implement data conversion for all the devices, which have the standalone recording option (the data conversion option can be configured in the menu of standalone recording parameters). 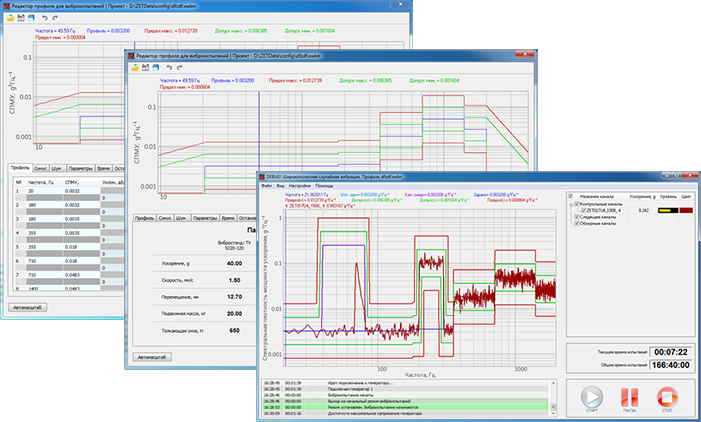 Users of software and hardware products by ZETLAB Company often have to conduct measurements, processing, and analysis of the obtained data in large volumes. Since the devices used have multi-channel connections and the software part of the system is used for solving several tasks simultaneously, it is often difficult for the user to arrange all program windows at a single display. Developers of ZETLAB Software have found a solution: now the program has a multi-display operation mode. The number of virtual channels has been increased up to 10, besides, it is also possible to assign a separate name for each of the screens. The program “Strain gauge meter” has certain limitations concerning the measurement channels. The signal processing is only available for the channels used for voltage measurements. The program has an integrated signals recorder, which is used for representation of the recorded data for the period of 60 minutes. The user can save the signals displayed on the graph to a file with *.dtx extension. In addition to that, the program also saves statistics of the channels readings in a chart format. The chart contains the following information: maximal value, minimal value, amplitude, average value, and RMS value. New version of the “Strain gauge meter” program supports the “Multichannel mode” option. Thus, in order to display several channels, now it is necessary to start a single copy of the program and to configure the Multi-channel mode option. – update of the programs from the scope of ZETLAB VIBRO software package: sinusoidal vibration, classical shock, vibration shock, and many other new features!